My oven is practically sparkling at the moment. We haven’t cleaned it in a number of years (I didn’t use a lot) but now that I do use it this product is very handy. I wasn’t sure if I really needed a whole other cleaning product for the oven but was pleasantly surprised with this product as it works really well! I think this product was great! instead of having to sit in the kitchen scrubbing your oven for hours, you just put the racks in the bag, leave it over night then wash off with warm water and looks literally brand new. I swear by this product and i will always buy this and recommend it. This oven cleaner is the bomb!!! My mum put me onto this oven cleaner. I was after something that would clean my oven but would not require me scrubbing and spending hours on it. It pretty much cleans itself. The price is very good so anyone can afford to get it and do themselves. 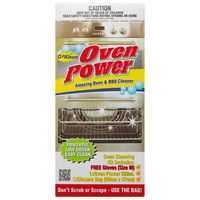 How would you rate Ozkleen Oven Cleaner Power Kit?